📰Precitools blog: Do you need special tools for standard bends? Main 〉 Materials 〉 Blog, news and notes 〉 Do you need special tools for standard bends? Every manufacturer of press brake tools has the catalog of standard positions of tooling. This means the availability to supply standard tool with the identified geometry, material and radiuses in the shortest possible time. For example, for us is possible to offer deliveries from 24 hours, but we need more time to prepare sectional (cutted) positions. If the radius will be changed, geometry will be changed or even the material will be changed the tool should become as special which means the longer delivery time and high costs. This is normal story on the market and there is no manufacturer ho is making customized requests without the addition of money and time. Now the example. Customer has several parts to produce and we can offer several standard press brake tools configuration. 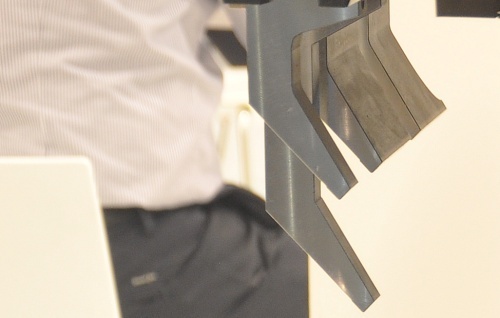 The main rule to offer press brake tools is unification which means the availability to produce max. possible different customer's parts with the same tooling. If it is not possible it is necessary to offer several positions. Or, for example, if the geometry of parts allows the development of one special tool it could be also offered. The main point is that even several standard press brake tools can cost much less than one special. And probably, the supplier is not bad if he will offer to you one general special tool for all the parts. They key of this offer is the reduction of necessary setup time. It means that if you have several configuration of tooling and you need the full length of press brake for one part this means that to produce other part you need to change tools. This is the main reason and necessity to understand the customer - does he need cheap price of minimum quantity of setup? Unfortunately not all the customers care about the details. They are looking for prices and after trying to solve the problems with the press brake tooling which arrived. Because if customer doesn't require single parts bending there could be variants. And for purchase office it is highly recommended not just compare the prices but compare the advantages and details of the offers. Big company usually have separate purchase departments where people just looking for the final amount but it doesn't mean that the offer is optimized. The moral is only one - 2 set of different tooling can do the same parts for example. But one set is cheaper and requires several re-setup. Price advantages? Yes, it will be cheaper. But for countries with big labor cost every re-setup is serious disadvantage and the reduction of production program. So, probably it is better not to care about the tooling price but the production and efficiency. And that is why we usually require from potential customers as much details as possible. Moreover, not only geometry matters but the percentage. Imagine that you have 1000 simple parts to produce and 10 specials. You require press brake tooling to produce all. But probably it is much more easily to order 10 special parts outside than to invest in special tools. So that is why even the percentage of configurations in your production plan becomes important. Special clamping attack for the punch is other story. Customer ignores the possibility to purchase adapters to change the clamping system and wants the punch with special attack and configuration which is exactly the same as the one he has supplied 10 years ago. This ignorance usually leads for completely new special and expensive tool and finally customer is surprised with the offer and the price on it. We are trying everytime to provide to the customer all our explanations but unfortunately it is not enough every time.